With Cleveland’s collapse Thursday night, the NBA cosmos have become fully aligned and the conference finals are set to soon begin. To help us make sense of these two colossal matchups, we called upon Special K Daily from the Harlem Globetrotters. The Panamanian-born player will be profiled in the June issue of Venues Today magazine. We sat down with Special K to get his picks for this year’s playoffs. You’ve been able to do dozens of television specials, reality shows and sports programs. What’s one of your more memorable television appearances you’ve had this last year? I enjoy playing the celebrity games for NBA All-Star Weekend. They happened to be in Dallas this year, and it was my second time playing the celebrity game and I enjoy that. That has to be my highlight. Speaking of the NBA, what are your playoff picks for the Western and Eastern conferences? In the West, I think it’s going to be the Lakers. Of course it’s not going to be easy against the Phoenix Suns, but I think the Lakers are going to take it. In the East, I’m picking Boston to beat Cleveland. I’m a big Kevin Garnett fan and I’m friends with Paul Pierce, so I want to see them all succeed and win the game, then go on to beat Orlando. That’s who I think is going to be playing in the championship, and after that, whoever wins, I’ll be happy either way. If you look at the four teams in the playoffs, which team owns the best venue? I like Los Angeles and the Staples Center, playing in front of all the stars. The building is beautiful and I have family there that doesn’t get to see me play live, except once a year. Boston is a great market. They’re having two playoffs right now with the Bruins and the Celtics. What’s it like to play at the TD Garden? It is incredible, I’ll tell you. Incredible. I think when we played there earlier this year it was almost sold out. 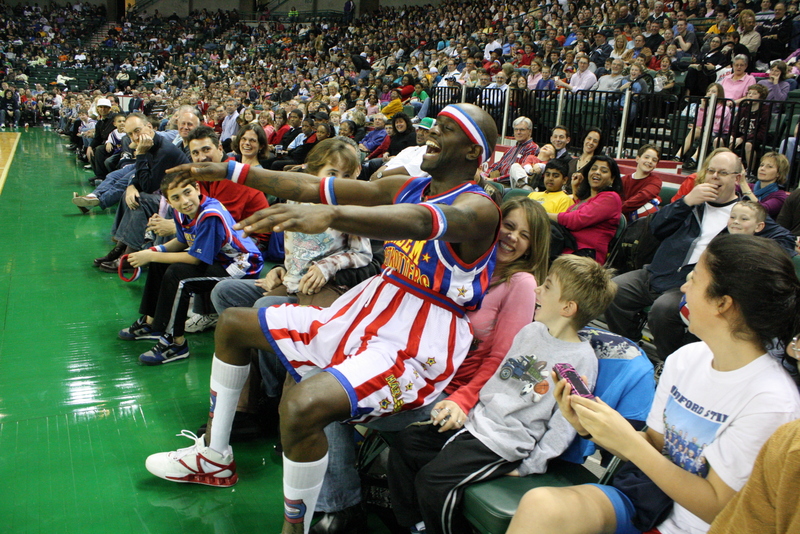 They have great basketball fans, and they also have great Globetrotter fans. The thing about us is that we have many fans that are not even sports fans but they just love what we do as Globetrotters. So we get those fans and also get the basketball fans that enjoy spectacular plays on the basketball court and Boston is one of those places that has both of those types of fans and I really love it and the energy is incredible. The history at the arena is incredible. And they’re going to build a new arena in Orlando, what do you think about that? That’s always fun. We just got back from Argentina and we played in a very, very historic arena called Luna Park. We were the first basketball game to be played in the arena, and then a few weeks ago, we were the last to ever play there. I wish we could be the first game to play in Orlando, but I don’t think that will happen. Its always fun to play at a new facility. Facilities are getting so sophisticated, that I’m sure we’re going to see some things that we have never seen in facilities before. So that’s going to be fun to see.